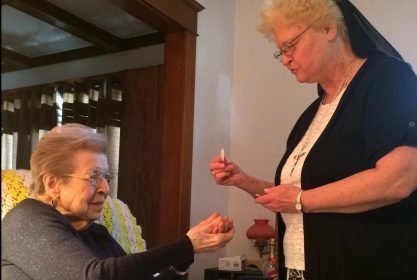 After 50 years in the classroom, Sister Karen Marie Voltz now works in parish pastoral ministry in Buffalo, New York. She visits the home-bound and the elderly, bringing them conversation, stimulation, parish news and, most meaningful, the Holy Eucharist. “Often, I am the only outside person they see all day. They tell me they miss going to Mass and that they are grateful to receive the Eucharist. I bring ashes on Ash Wednesday, blessed palms, the church bulletin and the monthly diocesan newspaper. I send cards to them for Halloween, Thanksgiving, Valentine’s Day, Easter. I write a friendly, personal note on each card. Dear Karen Marie: Your comment about your pastoral ministry is beautiful and very moving. It was a blessing and a delight to read it. Thank you for touching my day, my life, my mind, heart and spirit with your goodness and the goodness of your ministerial service. I never worked in parish ministry but LOVED being in hospital ministry for several years. A truly graced experience, in either setting. Take very good and gentle care of yourself even as you minister to so many others with goodness and gentility. Blessings.